University Archives: The official home for records that document IU South Bend’s origins and development and the activities of its officers, faculty, students and alumni. Civil Rights Heritage Center Collections: These collections tell the story of Michiana’s civil rights history, with an emphasis on African American, LGBTQ and Latinx experiences. Michiana Collections: The papers of publisher Franklin D. Schurz and the records of the Torrington Company and UAW Local 590 are two highlights from our collections devoted to Michiana history. Rare Books and Special Collections: Our distinctive collections include the Fink Autograph Collection (featuring Aaron Burr, Clara Barton and Booker T. Washington) and the Casaday Theater Collection. We are open to the university community and general public by appointment, with some materials available online. Contact IU South Bend Archivist Scott Shoger at sshoger@iusb.edu or 574-520-4392 for more information. Drawn from the Oral History Collection of the IU South Bend Civil Rights Heritage Center, the podcast South Bend's Own Words showcases the experiences of people who lived, worked and made South Bend their home, including members of the African American, Latinx and LGBTQ communities. More oral histories from the collection are available on Internet Archive. South Bend's Own Words has featured interviews with Notre Dame President Father Theodore Hesburgh, peace activist Lois Clark and blues musicians Oscar Jones, Jackie Ivory and Bobby Stone. Barton McLean and IU South Bend’s state-of-the-art Synthi-100 synthesizer. 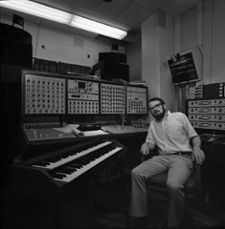 McLean was professor of music composition and theory from 1969-1976 and director of the university’s Electronic Music Center. From the late ‘60s to the early ‘80s, Richard Feingold, camera in hand, was a ubiquitous presence on the IU South Bend campus, shooting cheerleading practices and poetry readings, building dedications and student protests. Negatives from his personal archive, digitized in 2017-18 with the support of the IU Bicentennial Office, are available on Image Collections Online. 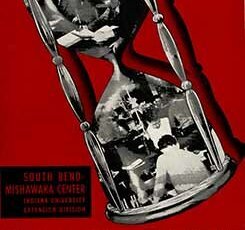 Find digitized class schedules, commencement materials, assessment plans, Academic Senate records, Affirmative Action reports and other IU South Bend records on the Archives of Institutional Memory, a digital repository for disseminating and preserving official Indiana University records. 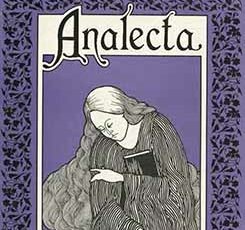 IU ScholarWorks Open Journals features back issues of several IU South Bend student publications, including arts journalAnalecta, gender studies journal New Views on Gender, the Graduate Research Journal, the Undergraduate Research Journal and the Undergraduate Research Journal of History. The Civil Rights Heritage Center’s groundbreaking LGBTQ Collection tells the story of LGBTQ life in Michiana through the records of organizations such as South Bend Equality, which encouraged South Bend to adopt LGBTQ language in its Human Rights Ordinance. 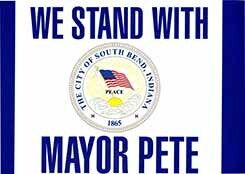 This undated poster was likely held by a supporter at community events held after South Bend Mayor Pete Buttigieg publicly came out as gay in June 2015. 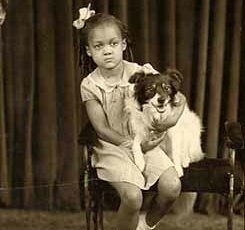 Civil Rights Heritage Center collections devoted to African American life in Michiana include the records of community center Hering House and the papers of community activist Helen Pope, attorneys J. Chester and Elizabeth Fletcher Allen, and the Streets family. Explore these resources and others on Michiana Memory. Barbara (Vance) Brandy and her dog, in a 1938 photo. Brandy was the first invited guest at the opening of the Civil Rights Heritage Center, formerly the Engman Public Natatorium, decades after she was turned away its doors because of her skin color.